Selected as Party of the Day on March 14th! 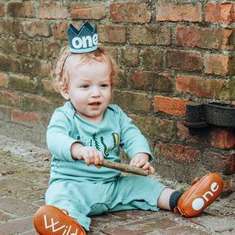 Our son is named after a character from the 1975 film "Jaws" - so when it came to selecting a theme for his first birthday, the answer was obvious! The party was held on a pleasantly warm summer afternoon in our “sunroom”, which is a covered deck at the back of our house. I spent three weeks designing, printing, painting, making and cutting as much of the decor as I could, it was so much fun! 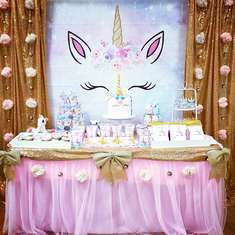 The room had five main sections: the buffet table of refreshments, the photo wall, the bar, the cake display and the play area/ponds. Each contained references to Amity Island and Jaws, from the labels on the food to the yellow barrels that decorated the pond area. One stand-out decor choice we made was to drape blue fabric from the rafters with silhouettes of sharks and other sea creatures in each swag, cut from black card stock. When the sun shone through, it was like being under the water. 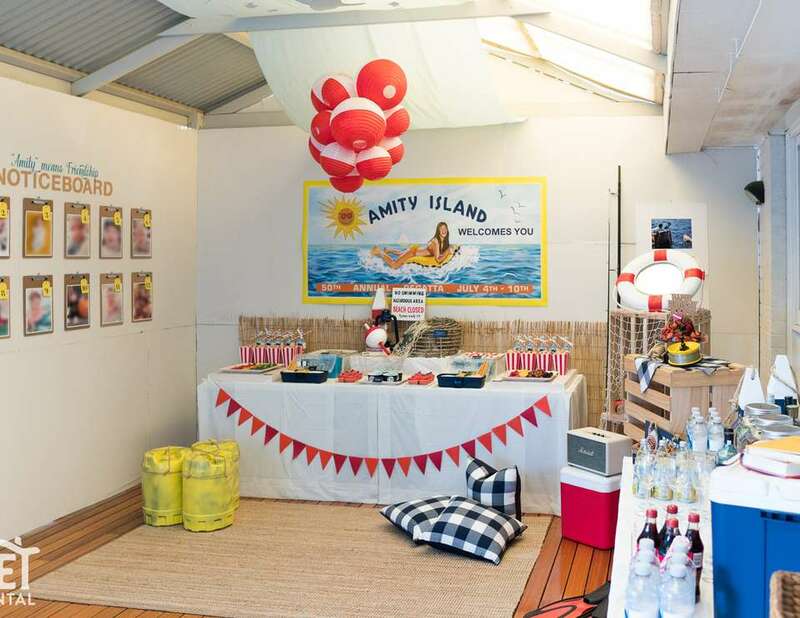 A chandelier we constructed from painted paper lanterns swayed gently in the summer breeze above the buffet table, and our guests couldn't resist graffiti-ing the Amity Island banner to mimic what occurs in the film once the shark starts terrorising the beach town. 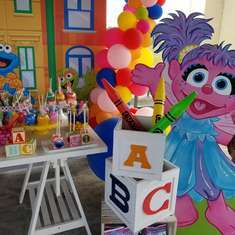 This party was a labour of love in every sense of the word – love for my son, love for my husband and his favourite film, a love of spending time with our friends and family and a love of entertaining in general. And I sincerely loved every minute of “making” this party. Even in the early hours of the morning when I should have been sleeping, I was still having a ball… And like all good parties, it was over far too quickly! Hooper’s friends and family range in age from 11-and-a-half months to in their 70s, and we wanted to have something on offer for everyone. We also have friends with special dietary requirements – vegetarians, coeliac disease, those following the low FODMAP diet and those who don’t eat sugar, so we put a lot of thought into providing something for everyone. This is not to say we didn’t have plenty of sweet treats with basically no nutritional value – it’s hard to resist at a kids party! On offer were: gluten free tortilla chips, sea salt potato crisps and popcorn, red butter-frosted cupcakes with a fondant shark fin, blue jelly with custom anchor spoons in monogrammed cups, "shark teeth" - wedges of cheddar with crackers, dip and breadsticks, a seasonal fruit plate and vegetable platter, shark-shaped and life-preserver shaped butter cookies with royal icing and an assortment of sweets/candy in shades of teal and blue. 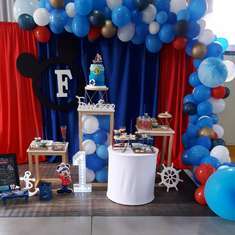 We also prepared finger sandwiches, party pies, pastries and donuts for guests, and our birthday cake was a tower of brownie with berries as garnish and a custom cake topper I made. We also served "fairy bread", an Australian kids party staple! We had beers and sodas on ice, Coke in a glass bottle, a selection of wine, gin & tonics as well as three dispensers of pre-mixed cocktails: “The Chief’s on Duty” = water with cucumber, strawberries and mint leaves, “Feeding Frenzy” = Aperol Spritz with red colouring added, and “Don’t Go In The Water” = Sea Breeze with orange juice instead of cranberry juice. We also had many bottles of water available (it was a very warm day) with Jaws-themed paper wraps by HelloMySweet. I made two types of favours - one for the kids and one for adults. Adults took home sea-salt popcorn with little tags that read "Take a Bite!" Each cello bag was tied with a yellow satin ribbon. For the younger guests, I sewed yellow fabric bags with a white felt anchor on the front, which were tied with white ribbon and had a little tag that read "Thanks Chum!" Inside was an assortment of treats: a bag of shark gummies, a wooden game of naughts and crosses, a wooden police car, a balloon to be inflated, sticker sheets, bubbles, a packet of crayons and a little kit with instructions on how to tie a Sheepshank knot. We had a waterslide and water balloons set up in the backyard for relief from the summer heat, as well as tents and umbrellas for guests to relax outside with their children in eyesight. Inside, I made a sandpit and a fishing game for the little ones. For the fishing game, I made "rods" out of painted dowel, with little hooks on the end of the line that could "catch" the fish I had cut and pasted in layers so they were sturdy. We put down padded mats underneath the ponds which were a gentle place to land for those just learning to walk around (or those that got a bit too excited about their catch! ).